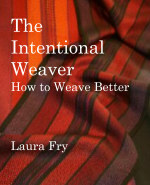 Let's face it - I weave a lot. I mean, I really do weave a whole lot - every day, mostly - apart from last year when I was too sick to weave for most of the spring and summer. In my heyday, I was weaving between 9,000 and 13,000 picks on an average day, pretty much every day. As such, we very quickly found the wear points in the loom - points that the average avocational weaver will likely never have a problem with in their entire weaving lifetime. Doug fixed those wear points - generally metal axles through wood - so that I have had no further trouble with them since they were upgraded. He has also modified the loom significantly in order to get it to perform more effectively for the things that I need it to do. There is one wear point, however, that really can't be upgraded as such - just repaired when it breaks - and that is the area beneath the shafts where a chain and spring runs from the right side of each shaft and attaches to the left side. 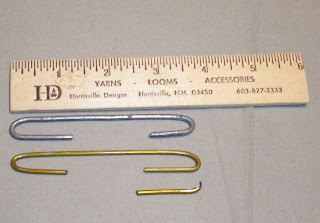 The hook that attaches the spring/chain to the shaft is a wire that pivots on a small metal pin at one end and hooks into either the metal chain, or the spring at the other end. Eventually these hooks wear and break. Tonight one of the shafts made a peculiar jump and wobble and sure enough, when I checked under the loom a chain with spring was laying on the floor beside the web. You can see the broken end of the hook on the very bottom right of the photo and how the wire wears thin enough it breaks. Since this happens infrequently, but routinely, Doug made a bunch of the hooks so that when they break all I have to do is reach for the peanut butter jar they are stored in, wriggle my way under the loom and reattach the spring/chain to the shaft and continue weaving. A fix of less than 10 minutes, including wriggle time. Although you can still weave if a hook is broken, it can also cause problems so it's just easier if I have replacements ready to hand so I can deal with it immediately. I don't know what AVL used originally - the original hooks are long gone. Doug has used coat hanger wire (the one on the bottom) which is pretty much identical in grist to the original. But the last time he made more, we didn't have any hangers to spare. He managed to root through his workshop and found some wire he had on hand that was ever so slightly thicker than the coat hanger wire, but which still fits into the slot. He made a jig to bend the wire and generally makes a couple dozen at a time. They don't have to be 'perfect' as the spring will accomodate a slight variation in length. As they break, I replace them until I've got 4 or 5 left and then ask him to make more. I should have mentioned that the way Doug fixed the metal axle through wood wear points was to insert cintered (SP?) brass bushings so that the metal axle is now running on metal instead of wood. As more used AVL's come on the market it's a good idea for a new owner to check where these points are and determine how much wear there is and if brass bushings should be inserted *before* the loom is assembled. One thing Mike has done that saves my sanity is to replace most of the nuts with aircraft nuts, which won't work loose with continual vibration. I've had to change the spring on the brake at least once due to the coil on the end breaking, but so far the current one seems to be okay. Doug rummaged through the local hardware store and bought several qualities/lengths of springs until we found the ones that worked best, then kept them handy. Your a hard worker! Thanks for all the help! I just purchased a similar vintage AVL this past weekend, and would love pointers on wear points to evaluate. Sometime next year- when things calm down around the book orders!! Thanks for all you do, and especially for all you share. The jig is just a wire bending jig he bought at a hardware store. I'd take one of the 'hooks' to a place that sells wire and tell the clerk you need the same diameter in something that can be bent. They probably have the wire bending jig there, too. Anything that moves will wear. Check moving parts routinely. If winter means dry weather, check for tightness of nuts/bolts where ever they are in the loom frame. Lubricate places that move a lot or quickly. Some people like to give the loom a good cleaning with Murphy's oil and paste wax. Last of the Fine Stuff?